Who was Colonel Nick Rowe? He was first and foremost a Special Forces Officer. He was a West Point graduate. He was a former POW, having suffered for five years at the hands of his North Vietnamese captors before escaping and making his way back to US forces on his own. He was a teacher in that he founded and taught the U.S. Army Special Forces Survival, Evasion, Resistance and Escape (SERE) Program which trains military of all branches how to survive if they are separated from their forces, how to evade the enemy and make their way back to friendly forces, how to resist the enemy if captured, and how to plan an escape. He was a devout Christian. He was a real live hero of our times who became a living legend in the Special Forces community until his untimely assassination by guerilla insurgents in the Philippines. 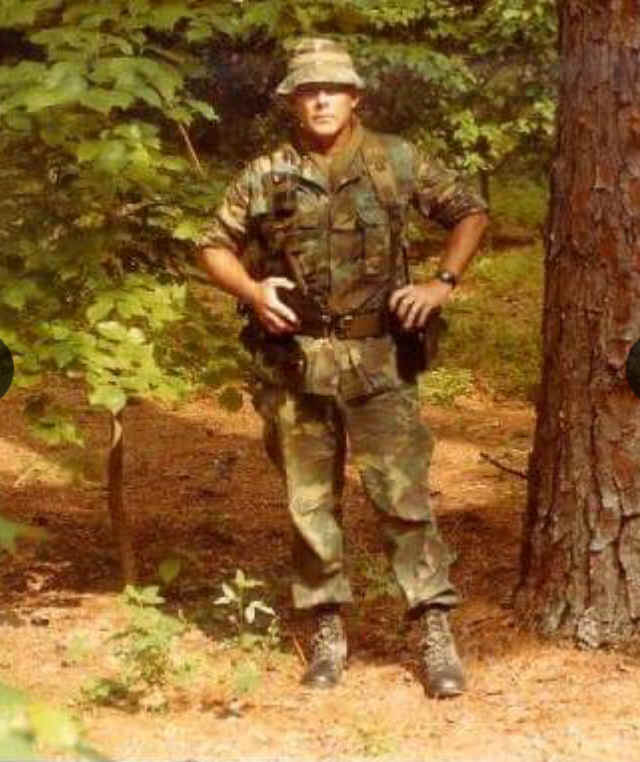 I met Nick shortly after he was recalled to active duty in 1981 for the purposes of developing and operating the US Army Special Forces SERE Program at Fort Bragg, NC. I had read all about his experiences as a POW in his book "Five Years To Freedom". I wasn't sure what to expect when I was introduced to him, I guess maybe I expected a "John Wayne' type, but instead I was pleasantly surprised by a soft spoken gentleman who had one goal, one mission and that was to better prepare our military to prevent them from ever being captured and should that fail, prepare them to resist and escape capture. I liked him immediately. On October 29, 1963, Capt. "Rocky" Versace, 1Lt. 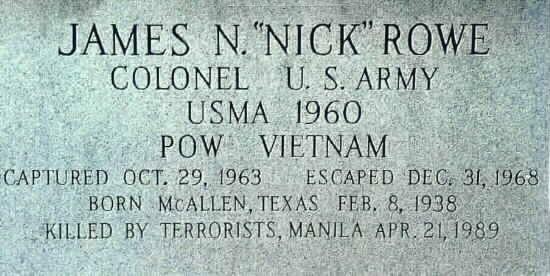 "Nick" Rowe, and Sgt. Daniel Pitzer were accompanying a Civilian Irregular Defense Group (CIDG) company on an operation along a canal. The team left the camp at Tan Phu for the village of Le Coeur to roust a small enemy unit that was establishing a command post there. When they reached the village, they found the enemy gone, and pursued them, falling into an ambush at about 1000 hours. The fighting continued until 1800 hours, when reinforcements were sent in to relieve the company. During the fight, Versace, Pitzer and Rowe were all captured. For 62 months, Rowe battled dysentery, beriberi, fungal diseases, and grueling psychological and physical torment. Each day he faced the undermining realization that he might be executed, or worse, kept alive, but never released. His home was a wooden cage, three feet by four feet by six feet in dimension. His bed was a sleeping mat. In spite of all this, Rowe was a survivor. From the start of his capture, he began looking for ways to resist his captors while he could make plans for his escape. Since he was the S2 or Intelligence Officer for his unit, he had access to all sorts of classified and sensitive information including camp defenses, mine field locations, names of friendlies and unit strengths and locations. All information the Viet Cong would love to know. Rowe concocted a cover story that he was a "draftee" engineer who had the mundane job of building schools and other civil affairs projects. A 1960 graduate of West Point, Rowe had left his ring at home with his parents when he came to Vietnam. Nick instead made up the story that he went to a small liberal college and really didn't know much about the military. The Viet Cong unsure whether to believe Rowe used torture to see if he would break and change his story. As a last resort his interrogators gave him some basic engineering problems which they felt would either validate Rowe's story or prove that he was lying. Fortunately, as engineering courses were mandatory at West Point, Rowe was able to fool his captors. Rowe's cover story was eventually broken but not through any fault of his own. All his efforts were destroyed when a peace seeking group of war protesters came to North Vietnam. As part of their visit to North Vietnam, the protesters had asked to see some of the American POW's so they could tell the American people that they were being treated fairly by the North Vietnamese government. Rowe's name was on their list that they gave their hosts along with the information that he was the intelligence officer for the Special Forces Advisor Unit. Rowe's captors were furious that Rowe had fooled them all this time. Even worse was they knew that the valuable information he had at the time of his capture was dated and virtually worthless to them now. Rowe's captors beat him for hours then stripped him and staked him out naked in a swamp. Now if you have ever had a mosquito bite you you know how much it hurts and itches. That night Rowe's body was covered with a blanket of mosquitoes that feasted on him for two days. Despite his captors best efforts to torture him, Rowe still would not break to their will or give them the old dated information. Rowe made several escape attempts. His first attempt was on 23 December 1964 with SGT Daniel Pitzer who was injured. 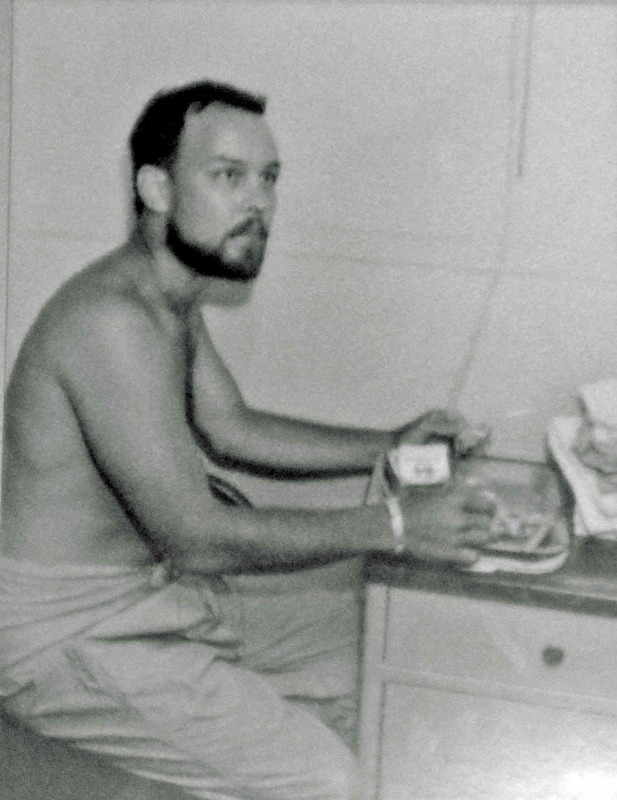 They were being pursued by the Viet Cong when Pitzer faced the realization that he could not go on and that he was slowing Rowe down thereby increasing the chance of both men being captured again. He urged Rowe to go on without him. Rowe began doing so until he heard the Viet Cong capture his friend. They began yelling that unless he surrendered to them, they would kill his friend. Although Rowe could have escaped he came back and surrendered to save his friend. Rowe made a second escape attempt in october of 1965 with SGT Len Tadios. Unfortunately they were recaptured the next morning. Rowe made a third attemp in early 1968 when he simply walked away from his camp. Luck was against him again when he walked into a regular VC camp. To his credit Rowe was able to convince everyone that he was became lost while looking for firewood for the POW camp. His last attempt was in the Fall of 1968 when he attempted to reach a main canal and flag down a plane. once again he was able to convince his guards he was simply fishing in the canal. 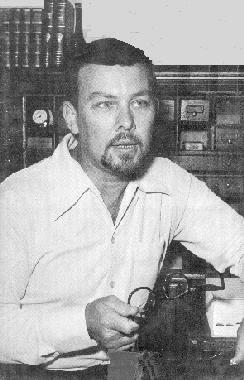 Rowe was scheduled to be executed in late December 1968. His captors had had enough of him - his refusal to accept the communist ideology and his continued escape attempts. 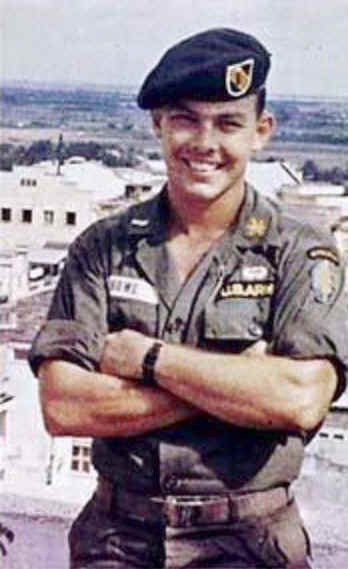 On Dec. 31, 1968, a Viet Cong patrol took Rowe into the jungle for the execution. As they were heading to the execution point Rowe heard a flight of helicopters. He shoved a guard to the ground and sprinted into a nearby clearing, waving his arms to get the pilots attention. They were American helicopters, but the first pilot to spot Rowe saw his black pajamas and nearly fired on him. Then he noticed Rowes beard that had grown out during his captivity. After realizing that Vietnamese men were incapable of growing a thick beard, the helicopter scooped Rowe up and carried him to safety. Among his surprises when he returned to civilization was that he had been promoted to Major during his five years of captivity. In 1971 Rowe was assigned to the Army Adjutant General to work on the the Army's POW/MIA program. later serving as a member of the advisory board to the National League of Families of Men Missing and Prisoners in Southeast Asia. 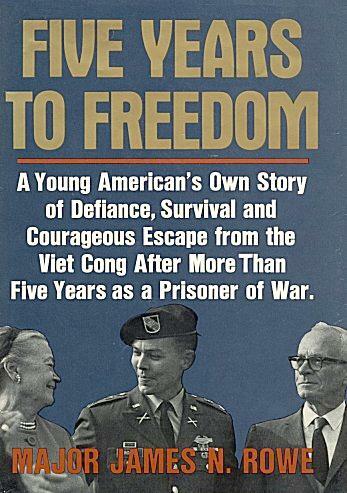 Nick published Five Years to Freedom, in which he recounted his ordeal as a Viet Cong prisoner, his eventual escape, and his return home. The book was the result of the diary he wrote while prisoner, writing it in German, Spanish, Chinese, and his own special code in order to deceive his captors. He also wrote Southeast Asia Survival Journal for the United States Department of the Air Force, published in 1971. 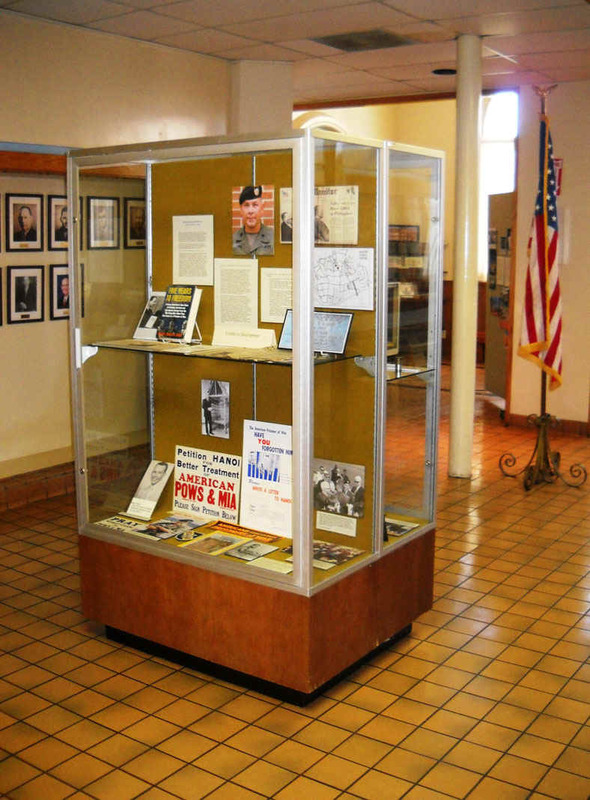 Upon his return home to McAllen, Texas, he was presented with lifetime memberships in the American Legion and the Veterans of Foreign Wars. In 1974 he made the decision to leave active duty although he continued his military career in the Army Reserves. 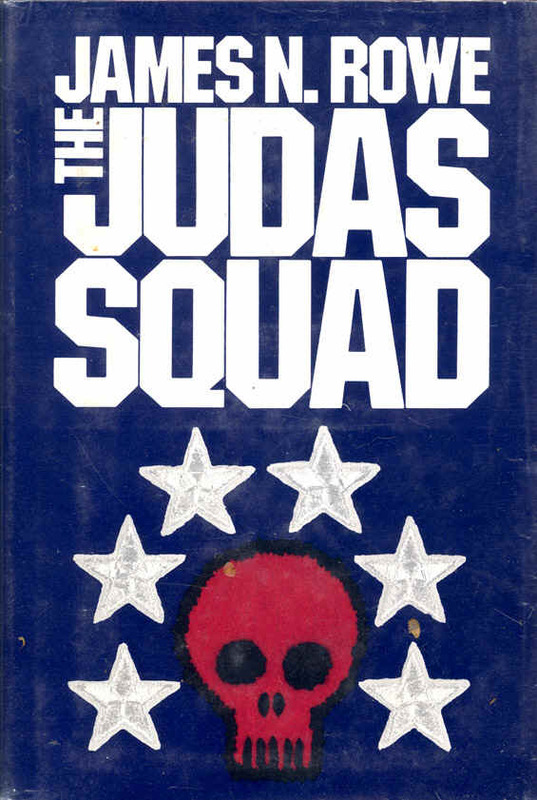 He continue to write co-authoring The Washington Connection with Robin Moore, which was published by Conder Press in 1977, and in the same year Little, Brown and Company published his first novel, The Judas Squad. The United States Army Special Forces School at Fort Bragg, North Carolina recognized the need for creating the SERE Program. When they started to look for an Officer to design the course and implement it into operation, Nick was everyone's first choice. He returned to the Army and Special Forces as a lieutenant colonel in 1981 and given the mission to develop and run such a program. His efforts resulted in a program that would leave behind a tremendous legacy at Fort Bragg: a course based on his prisoner-of-war experience. Called SERE - Survival Evasion Resistance Escape - the course today is considered by many as the most important advanced training in the special operations field. Taught at the John F. Kennedy Special Warfare Center and School, SERE trains soldiers to avoid capture, but if caught, to survive and return home with honor. Much of the SERE course is conducted at the Rowe compound. 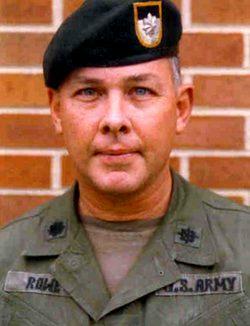 In 1985, Rowe left instructor duty to take command of a Battalion with the 5th Special Forces Group. In 1987, Rowe was assigned to the Philippines, where he was given the mission of Chief of the Army division of the Joint U.S. Military Advisory Group (JUSMAG) providing counter-insurgency training for the Philippine military. In this capacity, he worked closely with the CIA, and was involved in its nearly decade-old program to penetrate the communist New Peoples' Army (NPA) and its parent communist party in conjunction with Philippine's own intelligence organizations. Nick proved to be the right man for the job quickly earning the respect of the Philippine government and the hatred of the communist guerrillas who hoped to disrupt President Corazon Aquino's democratic Philippine government. By February, 1989, Colonel Rowe had developed his own intelligence information which indicated that the communist were planning a major terrorist act. As a result of the intelligence and his analysis of the situation in the Philippines, Rowe wrote Washington warning that a high-profile figure was about to be hit and that he, himself, was No.2 or No.3 on the terrorist list. Nick knew that his death would be a real propaganda victory for the communists. The communist guerillas had put a price on his head hoping to kill him and embarrass the Philippine government. In mid-April, 1989, Nick sent his green beret and bible home to his wife for safekeeping along with a letter informing her that he expected the NPA communists would be intensifying their actions with a planned major terrorist acts against U.S. military advisors their most likely action. Nick assured his wife that he was taking every precaution. On April 21, 1989, Nick was returning to the JUSMAG compound in Quezon city in an armored limousine when hooded members of the communist New Peoples' Army (NPA) attacked his vehicle with hit by gunfire from automatic weapons near a corner of Tomas Morato Street and Timoq Avenue just outside the JUSMAG compound. At least two hooded gunmen in a stolen car fired more than 20 bullets into his vehicle. Under normal circumstances these weapons alone would not have been a threat to the occupants of the vehicle. However, "Murphy's Law" of "Whatever can go wrong will go wrong" was in full force. The vehicle's air conditioning had broken down earlier making the inside of the vehicle almost unbearable in the Philippine heat. To compensate but still provide safety, the driver had opened the small window vent to allow fresh air to circulate into the car. One round found its way through and struck Colonel Rowe in the head, killing him instantly while another round wounded his driver. On the contrary, this act will only strengthen American resolve to stand with the government and the people of the Philippines led by President (Corazon) Aquino" we will not be deterred by terrorists. Nick Rowe would have it no other way. The US State Department called it a "Random Terrorist Act", however evidence suggests that Nick's Vietnam experience was not coincidental to his selection as a target. In June of 1989, from an NPA stronghold in the hills of Sorsogon, a province in Southern Luzon's Bicol region, senior cadre Celso Minguez told the Far Eastern Economic Review magazine that the communist underground wished to send "a message to the American people" by killing a Vietnam veteran. Minguez, a founder of the communist insurgency in Bicol and participant in the abortive 1986 peace talks with President Corazon Aquino's government told the REVIEW. We want to let them know that their government is making the Philippines another Vietnam. 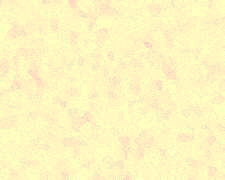 In May 1989, U.S. Veteran News and Report reported that according to a source who had served under Col. Rowe, the Vietnamese communist also wanted him dead and very likely collaborated with the Philippine insurgents to achieve that goal. He was a target when he went over there because of his dealings with the North Vietnamese and his time as a prisoner. They had him on their list. There are several unanswered questions. Among them: How did the Guerilla's know where Colonel Rowe would be? Only the Embassy allegedly knew the route that Colonel Rowe was to take that day. Colonel Rowe consistently varied his schedule and routes of travel. Why is it that he was ordered NOT to be armed, though his name was known to be on the communist guerillas' "hit" List? Filipino nationals Juanito T. Itaas (principal) and Donato B. Continente (accomplice) were convicted by a Philippine court in 1991 and sentenced to life imprisonment for the murder of Colonel Rowe, and 10 to 17 years for the attempted murder of his driver, Joaquin Vinuya. In 2000 the Supreme Court of the Philippines affirmed the convictions but reduced Continente's sentence to 14 years, concluding that he was acting as an accomplice, not as a principal. I took a different route from most and came into Special Forces... I had made a decision then that, as far as I was concerned, I had found what I wanted in the military, and I simply had to find a way to stay with it. 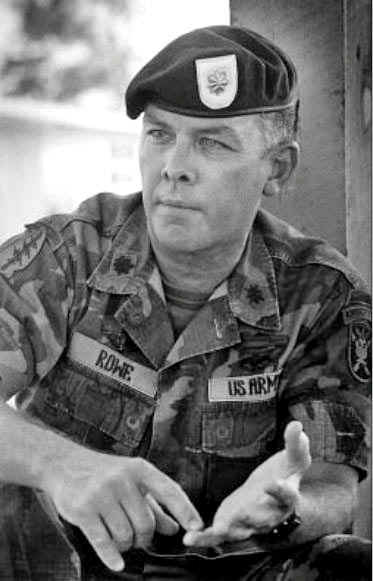 During his lifetime Rowe received the Silver Star, the Legion of Merit, two Bronze Stars, two Purple Hearts, the Meritorious Service Medal, the National Defense Service Medal, the Vietnam Service Medal with eight combat stars, the Army Service Ribbon, and the Republic of Vietnam Gallantry Cross Unit Citation. His nonmilitary awards included the American Patriot Award of Freedom's Foundation of Valley Forge (1969), the Outstanding Young Man of America award, the George Washington Honor Medal of Freedom's Foundation of Valley Forge (1974), and the Legion of Honor, International Supreme Council of the Order of DeMolay. 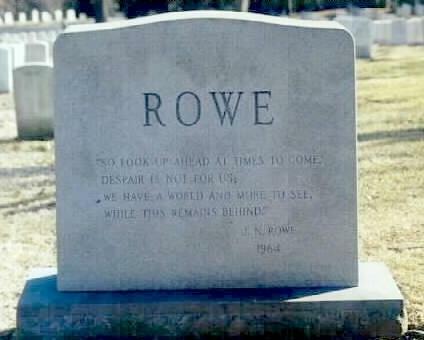 Colonel Rowe kept faith with the ideals of America even through his five years as a prisoner of war. 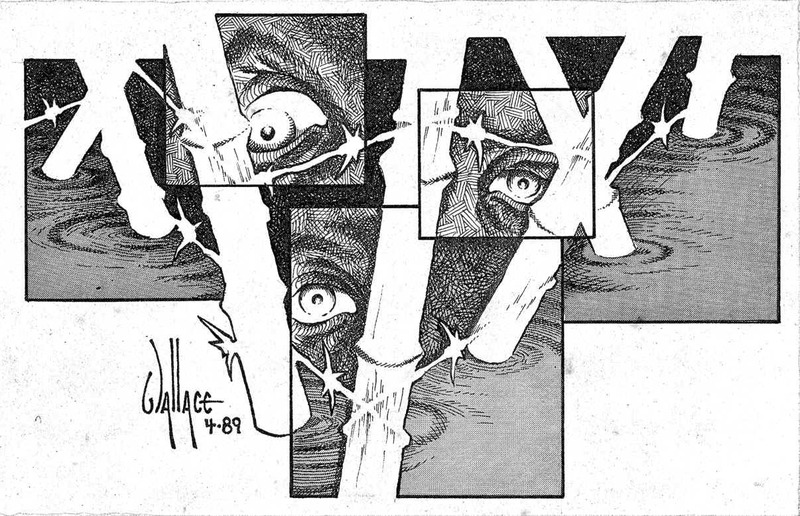 He never let the enemy break his spirit, continuing to resist throughout his captivity and eventually escaping. He returned home with an even greater determination to advance the cause of freedom and democracy. He was pursuing that goal when the bullets of a cowardly assassin cut him down. ...died in service to his country and gave all that mortality could give - his strength, his loyalty, his wisdom and his love. He died unquestioning, uncomplaining, with faith in his heart, and hope in the last words he wrote: the hope that Right would prevail and that the oppressed would be liberated. despair is not for us. James "Nikki" Rowe High School and a major street Col. Rowe Blvd. Formally known as 2nd St. in McAllen, Texas are named in his memory. The JROTC Drill Teams (Rowe's Rifles, Rowe's Rangers) and Shooting Team (Rowe's Rangers) of McAllen High School were named in his honor well before he died. A training facility, Rowe Hall, at the US Army Intelligence Center and School, Fort Huachuca, Arizonawas named in his honor. A training facility, Rowe Hall, Consolidated Training Facility (aka ISOFAC) at 5th Special Forces Group (Airborne), Fort Campbell, Kentucky is named in honor of Col. "Nick" Rowe. The two-story facility contains more than 60,000 square feet. Having been a member of the Order of DeMolay as a teenager, he was recognized with both the DeMolay Legion of Honor, the highest honor DeMolay confers, and was inducted into the International DeMolay Hall of Fame. An Order of Knighthood priory of DeMolay International in the state of Florida is named in his memory. 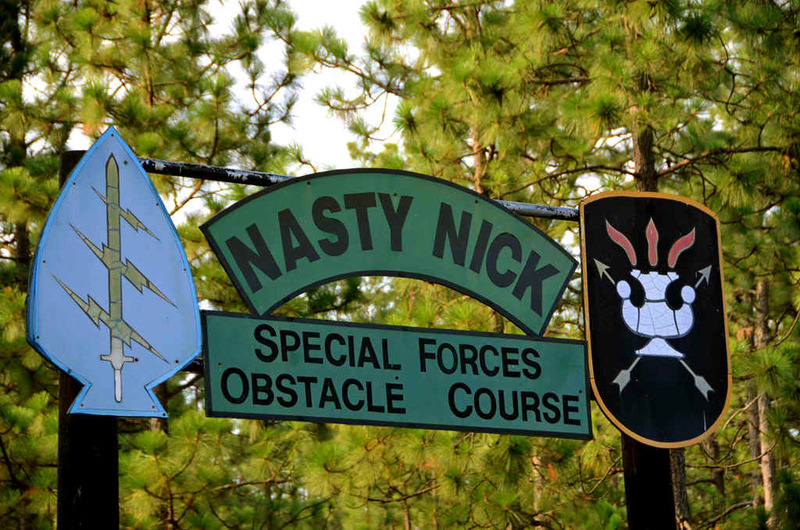 The obstacle course on Camp MacKall, arguably the hardest obstacle course in the Army, is named the "Nasty Nick"
An office facility, the Rowe Building, of the Joint United States Military Assistance Group ? Philippines, US Embasssy, Manila, was named in his honor. The Colonel James N. "Nick" Rowe Memorial, located in Veteran's Memorial Park in Union Beach, New Jersey, was dedicated on October 9, 2004, by friends, classmates from the West Point Class of 1960, and comrades-in arms, Among attendees were Major General Ted Crowley (a classmate) and Ross Perot and Colonel Rowe's widow and children. The Defense Intelligence Agency (DIA) in Charlottesville Virginia dedicated a building on May 2, 2014, to the former prisoner of war, and Army colonel who gave the ultimate sacrifice for his country. Colonel Rowe experienced more in his lifetime than most people will in many lifetimes. He was a Special Forces soldier, a POW, a hero, a teacher, and a friend to many. He knew the true meaning of freedom. His accomplishments will live on to honor him. He will be missed.